An innovative CRM tool that is powered by a world-class consumer marketing platform to help recruiters find, attract, engage, and nurture talent. Lead Manager enables you to source top talent, build strong relationships and generate qualified applicants, as well as measure the effectiveness of recruitment campaigns. A market-leading, global ATS to help you quickly and easily select and hire the best person for each position. BrassRing’s powerful search technology helps recruiters find top candidates and can leverage social networks to continually broaden the talent pool. A cloud-based onboarding solution that provides a seamless bridge between the candidate experience and the employee experience—and reduces cycle time, data-entry errors, and dependency on paper. 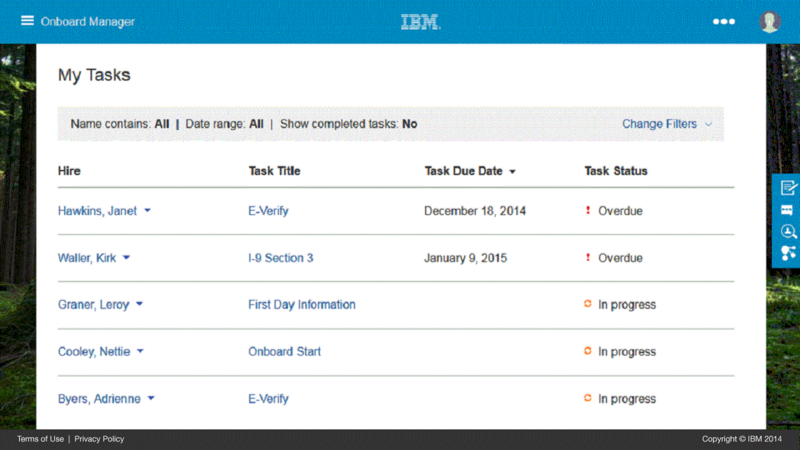 Onboard also helps you accelerate new hire assimilation for faster time to productivity. An analytical tool that measures and monitors the candidate web traffic during the application process within IBM® BrassRing®, providing a clear view of candidate behaviors to help you measure and manage the effectiveness of your recruiting strategy and application process. The IBM® Kenexa® Talent Acquisition Suite supports versions of Internet Explorer (IE), Mozilla Firefox (FF), Google Chrome and Safari.